We tend to equate democracy with the political ideology or system based on the ballot box. But there are more vibrant democracies in the corporate world without the ballot box. We need a more holistic vision of democracy and a more organic approach based on the collective instincts of people rather than on fixed ideologies. What is the essence of a true democracy? The popular conceptions of democracy equate it with voting. But the ballot-box is only a minor outward expression of democracy. In a holistic perspective the concept of democracy has to be viewed in a larger context of the highest political ideals conceived by human mind. They are the triple values of French Revolution: Liberty, Equality and Fraternity. The modern western democracies are based mainly on individual liberty. But liberty of the individual cannot be sustained in the long-term without the other two values: equality and fraternity. So, the triple values of French Revolution can be regarded as the foundation of sustainable democracy. However, in a narrower and a more pragmatic perspective, an effective or functioning democracy based on individual liberty must have two features: first is a free and full participation of the individual in the communal life, especially in decision-making; second, freedom of thought and speech or in a wider view, what is now called as “empowerment” of the individual and the community, which means the freedom to think, express, create, initiate, decide, plan, organise, innovate, experiment, learn and grow, with a minimum of external control and imposition. Interestingly, there are some democratic experiments in the corporate world from which the political world can learn a few lesson. There is at present a movement or an impetus in all progressive and forward-thinking companies towards minimizing hierarchy, profit-sharing, empowerment of the lower level or front-line workers and creating shared vision and values. All these are some of the corporate expressions of liberty, equality and fraternity or in other words, democracy. In fact corporate world is in a better position than the political world in arriving at a practical synthesis of the triple values of French Revolution because it is a much more efficient and innovative organisation, with a greater capacity for organisation and execution. The employees of SEMCO and Goray do not select their directors or CEO through vote. But SEMCO and Goray are much more efficient and effective democracies than many of the political democracies with a ballot-box, because there is a much greater participation of the individual in decision-making. If in a nation, every local community like the village, town, city, work-place, and other groups within them, are given the freedom to arrive at some form of effective democracies as in SEMCO or Goray, then the question of how the nation as a whole or a state chooses it’s prime minister or president or chief minister do not matter much. The main point we have to understand is that the British or American type of parliamentary or presidential system of democracy is not the only type of democracies or viable political systems. There can be other types of democracies which can perhaps produce better results. In our contemporary world, the new China seems to be moving towards a different kind of synthesis. At present China has arrived at a practical synthesis between political communism or Marxism and economic capitalism. And now, Chinese leaders are trying to promote Confucianism in society. Thus we can see that China is moving towards a synthesis in which each major organ of the nation will be governed by a different ideology – economy by Capitalism, polity by Marxism and society by Confucianism! However, China as a nation cannot realize fully her human potential, without incorporating the democratic aspiration for individual liberty, which is in its essence, not merely a political ideal, but a fundamental spiritual need of the human soul. Ultimately, a political system or government has to be judged not by what “ism” it is, but to what extent it was able to internalize the triple values of liberty, equality and fraternity in the consciousness of people and organise them in the outer life. Each political system conceived or created in the course of human evolution represents a collective need of the human life. There is a need for democracy because liberty, individual and communal, is essential for the growth of consciousness and life. There is a need for capitalism because free enterprise is necessary for creating wealth. There is a need for socialism because wealth, power, knowledge or culture of a community should not be concentrated in a few people but has to be shared equitably among all the members of the community. There is a need for aristocracy because there must be centers of excellence which pursue a higher standard of culture, perfection, knowledge, character, wisdom which exceed the aspirations and achievements of average humanity. Without such centres of excellence, mere pursuit of popular democracy can only lead to a uniform distribution of mediocrity in the community. There is also the need for an individual leader who can represent the aspirations of the common masses, and at the same time, by his or her living example awaken a higher aspiration in them for a greater ideal, vision or aim, a king-sage or a seer-statesman who can lead the communal life towards its higher evolution. And finally there is a need for a political system which strives to awaken the inner fraternity of people and organise it in the outer life. Every nation or community has to arrive at a workable political, social and cultural synthesis which can fulfill all these collective needs without getting trapped into rigid, one-sided ideologies. Michael Ray and Alan Rinzler (ed), The New Paradigm in Business, World Business Academy, pp.35. Sri Aurobindo, Foundations of Indian Culture, 1972, pp. 350-54. 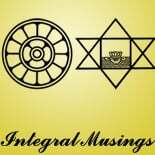 This entry was posted on April 9, 2014 by integralmusings in Polity and Governance.